I know so many people right now that are desperately looking for a job. They are willing to take whatever job they can find. Whether it be flipping burgers, mowing grass, pumping gas, or stocking shelves, they just need a job! Unfortunately, they can’t get one. For some unknown reason every place that has a “now hiring” sign seems to not really be hiring. People are turning in job applications left and right, but they never seem to get that phone call to schedule a job interview. Just filling out the application can take an hour or longer to complete. Most of today’s companies make you take a huge test as part of the application process. Even after passing the tests and submitting applications, still… No phone call for an interview!! This whole process has frustrated and discouraged so many people. There comes a point when you just feel like submitting a job application is a total waste of time. The problem however, is that just because people aren’t getting call backs for job interviews, the bills haven’t quit coming. This creates a huge problem. You have lots of bills pilling up that can’t be paid, but no job to earn the money you need to pay these bills. So, what then can an unemployed fellow do??? You could try telling your mortgage company that you’re trying to get a job, but no one is calling you back for an interview. Oh, wait… They wouldn’t care, would they? The fact is… If no one will give you work, then you’re just going to have to create work for yourself! “What would I do and how would I come up with the money to start a business”, you may ask? The good news is that you don’t need much at all to have your very own profitable business! 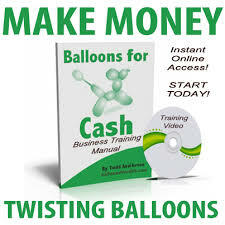 The Balloons for Cash program teaches you everything you need to know to launch your own successful (and recession proof) business! The Balloons for Cash program is only a one time low cost that will have you wondering why you ever wasted time filling out a job application! Best of all, the market is wide open with work! You won’t need to wait for a phone call for a job interview any more!! If you are one of the many people that has given up on trying find a job, don’t think that there is no hope… Order the Balloons for Cash program today! You’ll be making more money than you ever thought possible and having more fun than ever doing it!! There will be plenty of days when you actually think, “I can’t believe I get paid this kind of crazy awesome money just to twist balloons! !” So what are you waiting for? …Hopefully not a phone call from Wal-Mart. …Order the Balloons for Cash program now!! !